#991, 2nd Floor, KVS Complex, HRBR Layout, Banasawadi Outer Ring Road, Bangalore - 560043, Karnataka, India. 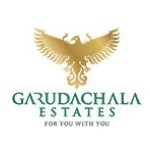 Garudachala Estates was established by a group of enthusiastic and visionary engineering experts. With a dedicated team, passion towards excellence and a strong accountability towards our clients. Our group has carved a niche and is already standing tall by providing world-class living spaces. We strive to upkeep our passion towards customer satisfaction all throughout. Compromise is something we toss out of our dictionary, and we strive to succeed and give you world-class passion-driven projects! When it comes to quality community living, Garudachala offers you spaces with unmatched quality, all while enhancing your lifestyle. We, at Garudachala aim at identifying the right people with the right opportunities for being the pillars of our entity. With this strong foundation of the key people, we focus and determine to ideate and design properties which not only aesthetically appeal to our customers, but are also environment-friendly in nature.